KARNIVOOL’s 2009 album ‘Sound Awake’ was so popular it had them touring the globe for three years afterwards with appearances at festivals such as the Big Day Out, Download and SXSW. In 2013 they’re back with ‘Asymmetry’ an album crafted over two years in the band’s Perth studio and produced by Nick DiDia (MASTODON / RAGE AGAINST THE MACHINE / STONE TEMPLE PILOTS) at Byron Bay’s Studios 301. Darker, more experimental, and in places heavier than the band’s previous works ‘Asymmetry’ is a recording that’s sure to see these prog rockers touring the world for at least another three years! NZRock: When I listen to ‘Asymmetry’ I hear a journey of epic soundscapes and atmospheric rock. You guys have said this is a bit of a left turn musically for you. What do you feel sets this recording apart musically from your previous ones? Mark: It’s definitely different. We as a band have ‘don’t do the same album twice’. It’s not anything consciously spoken about it’s just an old ethos we collectively agreed upon when we came together as musicians, this album was always going to be different. Musically it’s a branch in every direction, like we’re crawling our way further up the metaphorical tree. Some heavier parts, some darker parts, some simpler parts, some harder parts. It all really connects in with the Asymmetric theme we have going on underneath everything for the album, oddly or perhaps naturally made it both an easier and a harder process to write and record. NZRock: The production on this album is awesome. e.g. the meaty bass intro to ‘The Last Few’. What was it like working with Nick DiDia? Is he like a musical Jedi master? Mark: Nick is a great guy with a fantastic humour (ie. Similar to ours!). We get along with him really well, and it was fun to watch him have fun making an album of this type which obviously allows you to be a bit free-er in the studio and with certain recording standards and such. Not to say it didn’t come with its own set of challenges. We were used to working with a producer we knew in Forrester Savell, and in moving to Nick we were hitting problems in the way we did things and natural problems when you take five guys who write music in a really weird almost self destructive way and a producer who is used to working with people who go in knowing exactly what they want and exactly how to get there. But in hind sight I think Nick added a lot to this record and it was a fantastic experience for us to use someone of his calibre. NZRock: I really dig the synths and guitar tones on ‘We Are’ – the guitar is so rich and clear. With the guitar work are you forever chasing a certain sound or do you think you’ve found it on this recording? Mark: We do have guitar tones and sounds that we absolutely love and are often referencing them or going back to them for sections, but we also try to keep things new and interesting, trying very hard to not do the same thing twice. We are forever experimenting with different tones and different synths and finding balances that are both new and exciting but that also stay true to what we feel is the KARNIVOOL mission statement. NZRock: ‘We Are’ is a bit of a wakeup call. It illustrates the open minded / intuitive young vs conditioned adults who just believe whatever they’re told. Chris Frey worked with you on this video like he did on ‘Set Fire to the Hive’, is this song in some ways a continuation of that theme? Mark: I guess from an overview it is. Similar themes of apocalypse through current ways and social structures being a bit more like prisons than working societies. I think people are really waking up to new ideas, which in themselves come with their own problems.. I’m as frustrated with conspiracy nuts as anyone haha! But there’s a lot to be said from opening your eyes and looking deeper into things, we do try to present this in our music and from there I think the similarities stop. We don’t like to explain too much about the songs or clips.. all the better for it to be a medium between the listener and their own ideas. 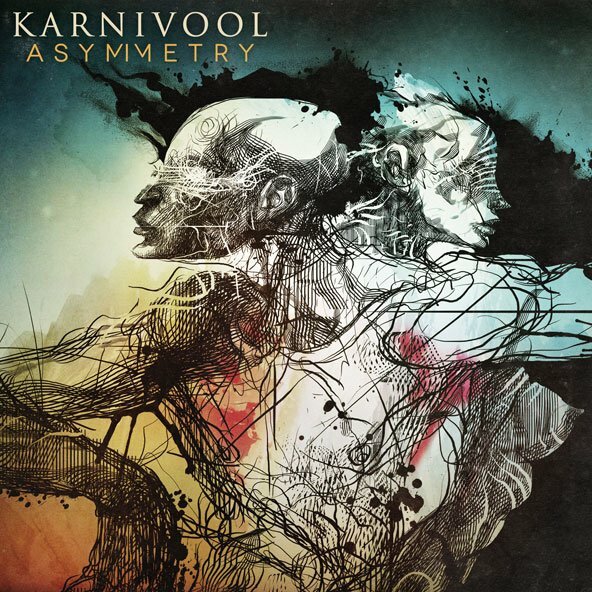 NZRock: KARNIVOOL’s music is quite introspective, especially this album. Is that something you aim for? To encourage people to think a little more about things rather than take them at face value? Mark: I think we are just like that as people and it comes out in the music. We’re not big fans of the obvious, so if it’s too apparent then we’ve probably failed! haha! NZRock: There are a couple of songs on this album that are named after mantras (‘Aum’ and ‘Om’), where’d the inspiration for those come from? NZRock: From your perspective, has exploring the darker musical avenues on this recording made for a more contrasting recording? Mark: Yes absolutely. We are such different individuals, some darker than others, and it’s that polarity and that contrast that makes this band what it is I think. We definitely have different backgrounds in music and all have different beliefs in expression and in thought.. but it’s the little bits that tie us together like a big messed up pile of red string that pulls the band together, writing music for us is like grabbing pieces of that string and pulling it tight. NZRock: I interviewed Jon a few years back and he said that KARNIVOOL has a pretty unorthodox way of writing songs which can be a lengthy process. Was that the case when it came to writing this album too? Mark: Oh boy yes. Nothing has changed despite our best attempts to make the process perhaps less time consuming and introverted. We seem to keep falling back on the system that is sometimes the most painful, but gets the best results… one day.. one day we will get better at this! NZRock: What were the biggest risks you took musically on ‘Asymmetry’ and what are some of your favourite tracks on the album? Mark: The biggest risk as always for this band was how much we leave open when we go into recording. Most bands will have all if not most finite details organised and ready to record when they book expensive studio time and producers whereas we usually go into the recording process with about 50-65% of the album complete.. rearranging structures and changing lyrics, sounds all the way right through.. in some instances even after mixing has been done so that we get the best outcome we can get, doing things the ridiculous way we do them. My favourite track at the moment on the album is ‘Aeons’, stand out track for me.. it’s really MY type of song.. moody and moving and emotional.. gets me worked up every time I hear it and I hope that reflects to people outside the band. NZRock: Are there any Justin Broadrick fans in the band? I thought I caught some glimpses of JESU in the title track. NZRock: Were there any extra tracks that didn’t make it onto the album? Mark: There was one track that very almost made the album.. but was decided against near the end of recording.. loved the track.. just didn’t seem to fit the album as a whole.. it will appear somewhere I’m sure. We don’t write 20 songs and pick 12 or anything, everything we write has the intention of being on the album. NZRock: The cover artwork is great and would look awesome on vinyl, do you guys have plans for a vinyl release? Mark: Yes, vinyl will be released, as well as back catalogue vinyl which we are very excited about. All properly re-set for vinyl which is important. Art we are very happy with, gentleman named Rene Almanza, Google him for his amazing works… incredible artist. We were lucky to work with him. NZRock: After the success of ‘Sound Awake’ was there any pressure to deliver something that could out-do that recording? Mark: I think there is always pressure of that kind. Who would want to release an album worse than your last? I think most of it came from ourselves, but you’re not thinking ‘make it better than that’, you’re just thinking ‘make it the best f**king thing you can make it’ it has to be ‘really good’ or we won’t release it. Simple as that. NZRock: You toured for three years on ‘Sound Awake’, do you hope to do it again on this time too? Mark: Absolutely! Getting the album out there and hearing peoples feedback on it is what makes those three years of living on noodles and getting no sunlight worthwhile. Then you can build up just enough confidence to talk yourself into doing it all again! NZRock: I see you guys played in Bologna, Italy recently, that’s not too far from my home town, what was that show like? Mark: That show was fantastic! It was a support show for STONE SOUR. They were a great bunch of guys and we had a blast. I unfortunately hurt my finger playing football in the carpark.. eugh.. ice and scotch are a mans best friend in those situations. NZRock: When are we going to get a chance to see KARNIVOOL in New Zealand again? Mark: I think 2014 will see us in New Zealand, no solid plans as yet but we have a list of places we are doing everything we can to get back to and NZ is high priority on that list.